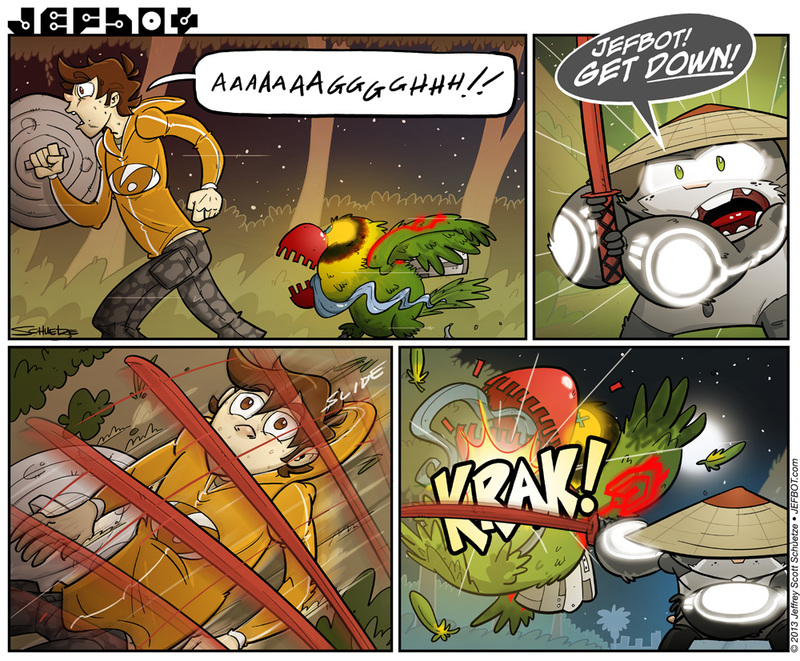 Sorry for the late strip, BOTpeeps! I almost didn’t get this one posted but I wanted to leave you with a comic strip before I left for the Phoenix Comicon tomorrow. Because I’ll be in Arizona until Monday, there won’t be any new strips until next week, but I’ll be blogging, tweeting, and sketching during my trip, so check back if you want to be updated on my road and convention shenanigans. Hope to see some of you at the con! I’ll be at Booth #781. More details on the JEFblog later tonight. Loving the extra time you have for the strip (sorry about the job!) but having a larger story arc and more cells are great – enjoy the con & we will all look forward to the next installment. thanks, man! glad you’re enjoying the bigger strips and latest storyline. the con should be a blast so i’m definitely looking forward to that but still have SOOO much to do before i leave tomorrow. I know there some way to do it, but I can’t think of exactly what it is right now. Mu’s badassery grew a level! Jefbot’s Matrix dodging grew a level! I really like those last two panels. So actiony and cool. curses…my chance to be first! stupid meeting…keep ’em coming! there will always (well, for the foreseeable future) be a next pair of Shades to claim, theBean, so don’t fret! of course, the next opportunity won’t be ’til next week, but still. Musashi haz skills! His badassness level in the last panel is OVER 9000!!! I got worried that you’d forgotten us, jef. I have a test week coming up and I need comedy in form of hilarious webcomics to keep my spirit up. Oh, and HAVE FUN IN PHOENIX! thanks, DAS! i didn’t forget y’all – was just uber busy! and fun was definitely had in Phoenix. details soon! Oh and that is one sturdy prop. I thought it would have been broken by now. I think that prop sword would have splintered in a million pieces if someone else (say you or I) had been using it, but Musashi is so BADASS that when he picks it up some of his strength flows into the sword and it doesn’t break. I also think JefBot’s ‘sliiiiiide’ is smoother, cooler, etc. because he’s also picking up some BADASS from Musashi. But that works both ways. They’re both getting strength from each other, in part because neither is fighting just to stay alive, but also to protect the other. In Dune they said “fear is the mind killer”. When you’re fighting to protect someone else, there isn’t much time left to spend on fear. So they’re both faster, more focused, stronger, and more calm… because they care about each other. They’re ‘in the zone’, not individually but as a team. it’s very possible, CC, since we don’t know the extent of Mu’s tech just yet. The [Slide] is fine I meant the [KRAK]! hmm… i like what you mentioned about bot and Mu acting as a team and strengthening each other, Stonefoot! not unlike a pokémon and its trainer, here we have an alien-enhanced pet and his keeper! as Stonefoot mentioned, Mu’s able to wield his weapon with skills mere mortals don’t possess, Maryz. and those bokkens are surprisingly well made – i’ve owned one for decades, and it’s a very solid piece of heavy wood. yeah, it would probably break if you struck metal with it repeatedly, but that bird’s beak and feathers would crack before the bokken would. as for the sound fx – i hear ya. while i don’t approve of that stuff in every instance, i felt this comic needed that extra “punch” to it. Musashi, cool as the other side of the pillow. I can tell you’re having a blast drawing these fight scene’s, they have a very nice kinetic energy about them. thanks, TPC! yep, definitely having fun drawing these – they let me stretch a bit from drawing “talking heads” most of the time for the gag-related strips. I can’t think of anything to say right now. My brain is still trying to get over the fail that is the next Xbox. It’s just got so many things going against it right now that it’s not even worth considering buying it. tell me about it, Fijiman – most of the people i talked to at the Phoenix Con about the XBOX One were seriously disappointed. i didn’t run into one person who was excited about it, actually. we’ll see how it goes when it ships. hopefully, by then, Microsoft will have figured out how to deal with the probs. See you at the con, bot! I’ll be the guy (or just a guy) dressed as Fix-it Felix Jr.
ha! looks like bot would win your spontaneous limbo contest, Sarah W! Jeffbot is well conditioned by Mu. true that, Orzahn. maybe he’ll survive this thing after all. WHACK! is probably the only thing in Mu’s arsenal right now. i dunno, ROM! – something tells me Mu has more tricks up his sleeves, yet. Wait…just dawned on me. How tall is Mu? Exactly HOW DOWN did ‘bot have to get for panel 3 to work?! Great…this is the thought that’s gonna keep me awake tonight. Y’know, now that you mention it, ‘bot does seem to have dropped to the ground, considering how close-by the garbage can lid is (heck, I’ll even give him a few inches by assuming that Mu is flying through the air). Mu is even more awesome than usual in that last panel. I can almost hear the soundtrack that accompanies this strip. yep, Mu just keeps getting more and more awesome, Shanna! heh. not weird, KB. skillful! When should I expect then next one? Mushashi needs a little Gi robe. Like the one Samurai Jack had. ooh, that would be cool, Anime fan! we’ll see. he takes so long to draw as is, cuz he has so many accessories, now. especially when he’s carrying around Yuki! I just can’t get the audible word “Thwackita!” out of my head when I read this comic. “Wackity-wacky Power Attacky”? You made me think of Weregeek with your ‘Thwackita!’ there. Dustin said “WWPA” in one of the strips, and Abby’s response was: Okay, you die now! Then she attacks him with a pillow. heh. “Thwackita,” Jesternario!!? where does that come from? yeah! See you at Phoenix Comicon!! This birdie got his KRACKer… Ok bad pun, but good comic ! I would have said “Polly got a KRACKer”, but ok.
that’s a good one too, Jason! Just attended the Dallas comicon. It was fun, but the last big con I attended was in Phoenix, back in the early 90’s (my pre-military days) and those con’s went pretty much 24 hours, not shutting down at 7pm like they do here in TX. Please tell me that is still the case! I can dream, can’t I? Word must be spread back to the heartland! Good con’s do exist! There is hope for us. Perhaps a child, with a young animated friend, or a psychotic killer robot (yet at the same time friendly and quirky) can help get this message back to us in time!